Summarizes the schemes and technologies in RF circuit design, describes the basic parameters of an RF system and the fundamentals of RF system design, and presents an introduction of the individual RF circuit block design. Forming the backbone of today's mobile and satellite communications networks, radio frequency (RF) components and circuits are incorporated into everything that transmits or receives a radio wave, such as mobile phones, radio, WiFi, and walkie talkies. 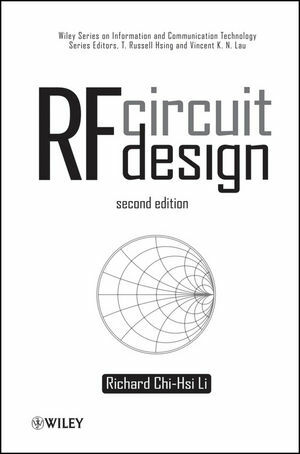 RF Circuit Design, Second Edition immerses practicing and aspiring industry professionals in the complex world of RF design. Part One explains the different methodologies between RF and digital circuit design and covers voltage and power transportation, impedance matching in narrow-band case and wide-band case, gain of a raw device, measurement, and grounding. It also goes over equipotentiality and current coupling on ground surface, as well as layout and packaging, manufacturability of product design, and radio frequency integrated circuit (RFIC). Part Two includes content on the main parameters and system analysis in RF circuit design, the fundamentals of differential pair and common-mode rejection ratio (CMRR), Balun, and system-on-a-chip (SOC). Part Three covers low-noise amplifier (LNA), power amplifier (PA), voltage-controlled oscillator (VCO), mixers, and tunable filters. RF Circuit Design, Second Edition is an ideal book for engineers and managers who work in RF circuit design and for courses in electrical or electronic engineering. RICHARD CHI-HSI LI has more than twenty years experience with RF circuit design and has worked for companies such as Motorola, Texas Instruments, and RCA. Professor Li has taught many courses and given more than sixty lectures on RF circuit design in recent years.